Healing Diamonds get their name from the ability to heal sickness and depression. They have an energy source in them that makes for powerful healing faculties. A diamond increases the energy level of anything it comes in contact. Their energy is very effective when you put them together with other crystals. A large diamond is excellent in blocking geopathic (developing bodily imbalance or illness, due to lines of harmful energies which radiate from the earth) or electromagnetic stress and is a protection against cell phones worn as earrings. The energy source in diamonds can increase a negative energy as well as positive. 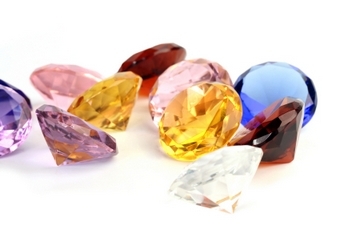 United States medical researchers have found diamonds can be used to aid in cancer treatments and malignant tumors. They developed a patch studded with diamond particles to aid in chemotherapy treatment. The patch is placed over the tumor during chemotherapy and the diamond gradually release chemotherapy drugs directly into the tumor, in hopes of no side effects of the common treatment. The patch with the diamond dust (particles) is place again on the malignant tumors in follow-up treatments to ensure the cancer cells are gone and lowering the risks of recurrences, fore the diamond dust on the patches has a high molecular surface area which is ideal for drug-carrying properties, a theory scientists claim. 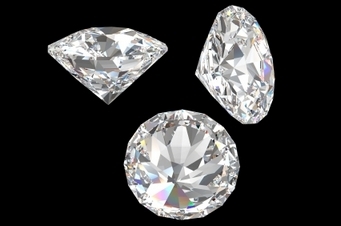 Some mined diamonds have too many inclusions to be cut and made into jewelry, so instead, they are used for medical research and applications. Synthetic diamonds are also used in medical research. Researchers found that synthetic diamonds possessed a material property called chemical-vapor deposition (CVD), which produced clouds of microscopic diamond crystals from carbon-containing gases such as methane, 20 years old. This CVD diamond can be grown in sheets or moulded shapes, its mist of crystals can also be used to drape solid objects like razorblades or drills in a hardwearing diamond coat. Diamonds have the potential application for surgical treatments due to its extreme durability and chemical resistance, it can be used in the human body. It is predicted that, in the future CVD could be used to coat joint replacements in patients, to save the joints from being replaced after 15 years or more. One day, we will have machines with diamond parts so small they can be injected into the bloodstream and programmed to monitor blood sugar levels in diabetics or clear a blockedartery, and help with other diseases. Healing Diamonds have the ingenious and 'extreme' uses that will affect all our lives, from our technology to our health, today and in the future.